What Happens When Criminals Don't "Age Out"? What Happens When Criminals Don’t “Age Out”? Home » Gold & Blue Magazine » What Happens When Criminals Don’t “Age Out”? An unexpected trend is happening in jails across the country: The arrest rates for men and women over the age of 50 have doubled in recent years. Statistically, once a person turns 30, he or she is less likely to be involved in criminal behavior — a phenomenon known as aging out. But for some reason, those over 50 are bucking the trend. 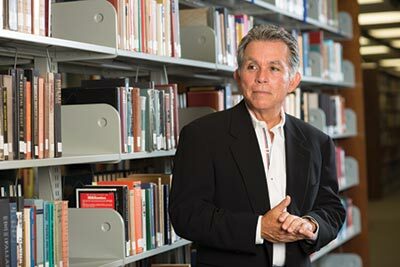 Armando Abney, Ph.D., Professor and Chair of the Department of Criminology and Criminal Justice, has been researching the rise of the elderly offender with help from Christopher Treviño, a St. Mary’s junior and McNair Scholar. They hope their findings will help law enforcement agencies better understand and address this issue. “With the rising cost of care for these elderly inmates, officials may rely on further research to prevent the arrest rates from rising or alternative methods of care for convicted criminals,” Treviño said. Abney (pictured above) and Treviño found that in 2011, more than 240,000 offenders nationwide age 50 and older had been arrested and convicted for crimes such as aggravated assault, arson, auto theft, burglary, larceny theft, robbery and sexual assault. Caring for elderly inmates costs an average of $100,000 per inmate each year – twice the cost of caring for younger offenders. Abney and Treviño suspect that many offenders in this age group, most of whom are among the baby boomer generation and Vietnam War era, suffer from substance abuse and mental health issues. “It will be interesting to see why the criminal behavior has instead continued at an older age for this particular generation,” Abney said.